Scouts from all over the Cornhusker Council spent a part of their fall raising money for the program by selling popcorn. One of the items they sold was a donation of popcorn to the Military. Their was wonderful support from our community both popcorn sales and the donation to Military grew over last year. 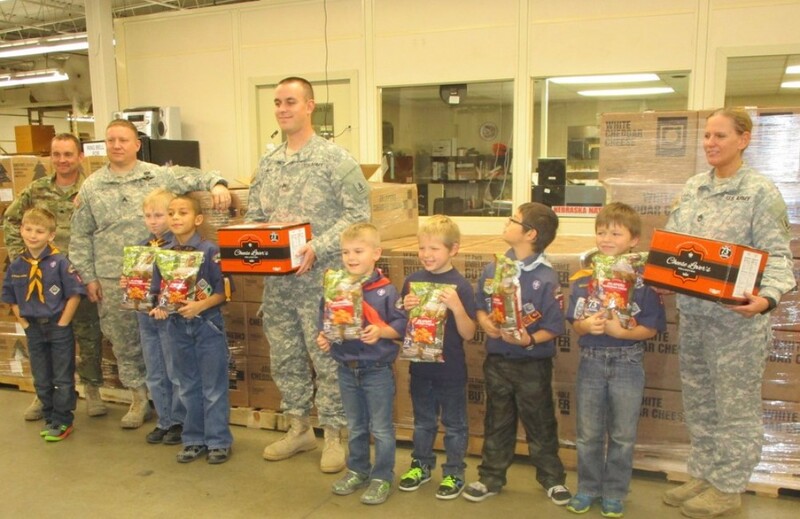 In December some of our top Military selling Scouts had a great time delivering the $60,000 dollars worth of military donated popcorn sold by Scouts! The Soldiers and families have said thank you very much as they pickup from their family gatherings and while on drill. About half of the $60,000 worth of popcorn was sold by actual Scouts the remainder was donated by the Cornhusker Council and Trails End, the popcorn manufacturer. The popcorn is being distributed to families and Soldiers across Nebraska while at holiday gathers or on drill this month.